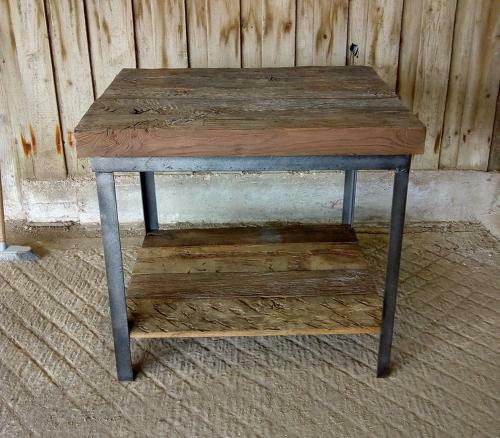 A lovely, petite, oak kitchen island or sink unit with metal base made using beautiful reclaimed materials. The oak top comprises of thick old oak beams and there is a low shelf made from oak floorboards. The oak sits on a reclaimed industrial base. The kitchen island has rustic and industrial design features and will therefore fit well with many interiors. The island can be used in the kitchen, for displaying or storing items or a basin could be mounted to the top and the island converted in to a sink unit. The island is reclaimed and therefore the oak has some rustic character knots, surface cracks, notches and marks. The wooden top is rustic and uneven. The metal base has some scratches, marks and slight tarnish. The kitchen island is a fantastic item with a stunning design. Perfect for a rustic property or industrial space, it is the ideal island or sink unit.